Welcome to the PowerFULL Spotlight series! This is something that I’m not having a specific cadence for; rather, I’ll be shining a spotlight on electric, powerful change-makers so you can get the goodness of the podcast questions in written interview format! 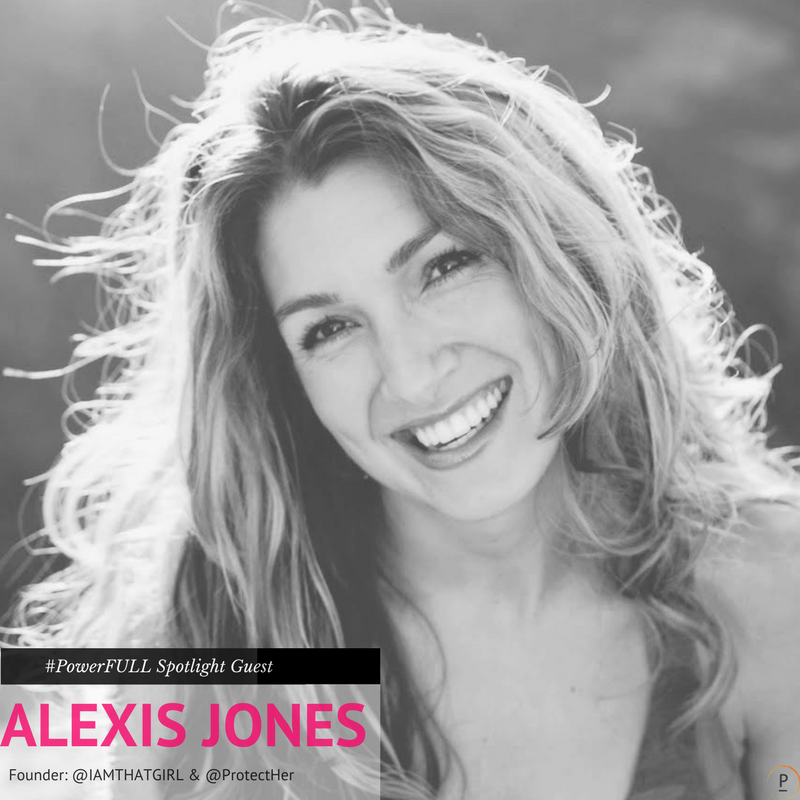 My first spotlight is on Alexis Jones– a manifester of the best kind. She’s the founder of I Am That Girl and ProtectHer, a renowned speaker, author, activist and media personality. She most recently also consulted on the show 13 Reasons Why (if you haven’t watched this — go forth and do! But it’s heavy, so make sure you have recovery time). I first came across Alexis back in 2014, because I joined the LA chapter of an amazing movement, community and non-profit she created years back called “I Am That Girl”, which empowers women of all ages to support and empower each other — collaboration over competition, which is something I was sooo looking forward to. After spending time with the local chapter, I met her at a screening of Lizzie Velasquez’s film “A Brave Heart” and realized what a truly inspiring, kind and warm human she is. Alexis is definitely a shining example of one who is living PermissionLESS, and has not only blazed her own path to fulfill her purpose, but is impacting hundreds of thousands of others in the process. Since I had the chance to send over these questions for her to answer, she’s launched ProtectHer, with a mission to revolutionize education around sexual assault prevention, by starting in the places where it often does; the locker room. THANK YOU TONS, Alexis, for taking the time to share your thoughts on the below! Your story and thoughts are inspiring to so many. Finding your inner confidence, your voice, and loving yourself is definitely key in living a PermissionLESS life and feeling confident that you’ll find your way. Can you talk a little bit about any defining moments in your life where you started to realize and trust in your potential? I’m a big believer that life isn’t necessarily about the big moments in life when we realize our potential (and that’s not to get out of answering your question! Haha). I just believe in the notion that life isn’t about being brave all the time, it’s about being brave for the five seconds here and there when the invitation presents itself. I think I’m proving to myself and earning confidence every day. Potential feels like a stagnant state for me, getting out in the world, messing up, failing, getting knocked down and then having the audacity to get back up; that’s when I remind myself I’m a Gladiator. I think we get to be brave all the time, when we speak up for ourselves, when we own our feelings, when we have the courage to say things like “I’m sorry,” and “I forgive you; when we stand up for the things we believe in and stop apologizing for existing. What would you say the most challenging obstacle was that you came across when launching IATG or other initiatives, and how did you break through that obstacle? The obstacle for all of us tends to be the devil that’s inside our head in the form of self doubt! Whenever we have a dream, it tends to get crushed inside our mind before it ever makes it out of our mouths. I’m for sure my own worst critic and it’s something I’m working on every day; to be more compassionate with myself, more trusting that I’m smart enough, capable enough- enough in general! I broke through this crippling self doubts by surrounding myself with the most incredibly loving, inspiring and encouraging humans! We are only as powerful, as strong and as brave as our tribe. When I fall or trip or face plant; I have a team who picks me up, dusts me off and puts me back in the trenches. My tribe is my secret weapon, with them, failing isn’t an option. What are some failures that you truly feel shaped and paved the way for your successes? Where do I start? Haha. They happen every day, but I think how we view “failure” is part of the problem in society and why so many people fear it. To me failure is simply a temporary defeat, I refuse to accept it as permanent. Every “no” I’ve gotten has just been fuel for my fire. Whether it’s trying to raise money, create a partnership or having an idea shot down; I just see it as an opportunity to learn something and to get stronger. No one likes failing, that’s the funny thing. We all think we’re so unique in our aversion to looking like a idiot and falling down, but we all go through it so maybe if we realized it was super normal we wouldn’t be so afraid. The most successful people I know have fallen down more than anyone else; the only difference is they have the humility to not care because the one thing they know is unlike everyone else, they have the grit and determination to get back up. Every. Single. Time. What part did mentorship play in your path and how does one go about finding a mentor that can help guide them in their new endeavor? Mentorship is everything. Like I said before, your tribe is an indicator of where you are headed and what is possible. I heard someone once say that you’re an average of the five people you hang out with the most. Experiential knowledge is exponentially more powerful than theoretical knowledge so I’m a HUGE fan of learning from those who’ve come before me! I truly believe we all have the same purpose; like we all major in the same thing in the university of life but we all have different minors. I think we are put on the planet to love and be loved. So my WHY, the reason I get out of bed is to love people back to life. We’re all broken. Not to be a Debbie downer, but we all experience heartbreak and disappointment and failure and so many people don’t have the right tribe to remind them that they are even more beautiful with cracks and fractures. So I truly believe I’m here to love people back to life. HOW I do that is through story telling. My purpose may be to love people, but my passion is to do it through storytelling. Whether it’s through books, or speeches, or producing films, or videos or any way in which I get tell stories and inspire people… that’s my jam! What’s a fun ritual, activity, or thing you do when you need to pull yourself out of being heads down in work, or just a general funk? I love to read. If I won the lottery, I’d get 10 PhD’s back to back! Seriously, I’m a total nerd and I always have about fifteen books in a stack waiting for me. So when I need to get out of work mode, I’ll curl up with a book. I also LOVE being active and married a professional athlete so doing anything outside in mother nature always rejuvenates me: swimming, paddle- boarding, yoga, cycling, etc. And lastly, movies! My hubby and I have an actual monthly budget for the amount of movies we see! Haha. Clearly I love storytelling! What does a typical week look like for you with all of the initiatives and projects you’re working on? The only consistent thing about my life is how inconsistent my life is! I spend an obscene amount of time in transit: planes, taxies, cars, etc. So if my feet aren’t up in the air literally, then I’m usually posted up at a coffee shop getting caught up on work and dreaming about all the exciting things I want to do in my life. What are 2 badass songs that gets you pumped up? I love boxing to Eminem and JayZ. But honestly, I LOVE music and more often than not, you’ll find me with headphones on, jamming out to my latest favorites. Who is someone that you feel truly lives PermissionLESS (it could be anyone – someone you don’t know, someone you do know, etc) and would love to see interviewed? I’d love to see Sara Bordo or Danielle Gano interviewed. They are two of my best friends and two of the bravest women I know. If you’re interested in learning more about finding an I Am That Girl chapter that’s local to you: Local Chapters.